Article first published as Book Review: ‘The Cost of Sugar’ by Angela Brown on Blogcritics. Now, I know poetry is very subjective and thus reviewing poetry is almost an impossible feat as each reader will relate to a poem in their own way and through their own heart. However, I can say that Angela Brown was successful in portraying her own heart, her own voice. Her poems are not cookie cutter poetry. Their melody is not determined by rhyme but by a raw heart. This is why I loved “The Cost of Sugar.” This is why I related to it and was able to experience a cultural reality far from my own. As a reader, the poems contained in these pages made me look within myself as I learned from her experience. As a poet myself, I appreciated how genuine feeling and raw emotion came through the words she chose, generating the music that speaks to the heart. 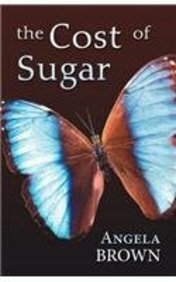 “The Cost of Sugar” by Angela Brown is a must read. It is for sure a keeper which I will revisit and share with my loved ones again, and again. This entry was posted in Books, Poetry - Non-Fiction and tagged Angela Brown, Book Review, The Cost of Sugar. Bookmark the permalink.